High above the planet Earth, an alien probe appears -- and in an unspeakably horrific instant, releases a deadly blast that strafes the planet's surface, leaving a miles-wide, smoldering crater of destruction in its wake. Millions die in Florida, Cuba, and Venezuela, their lives blotted out in a blazing millisecond. Just as swiftly, the probe implodes and crashes on the planet surface, but the remnants provide no clue as to its origin. Who are the attackers, and what provoked them? 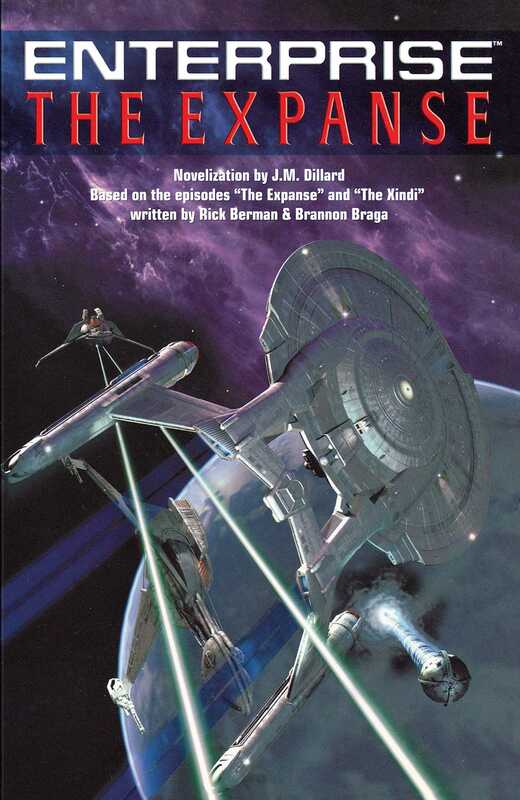 Aboard the Starship Enterprise, Captain Jonathan Archer learns of the destruction. His ship is called home; it is uncertain whether its mission of space exploration will continue. Archer faces the greatest crisis of his career: Should he believe Silik's time-traveling master, and expose his ship and crew to the perils of The Expanse, in hopes of saving Earth from destruction? And can he convince Starfleet Command and the Vulcan High Council to let Enterprise go to face her biggest challenge? He was a Xindi warrior, of his culture's highest class, and out of a sense of decorum he had worn his ceremonial armor on this, his last mission, though he would not need it, and though it could not protect him from his fate. He had already attended his own death ceremony, already been honored for the heroic deed he would perform on behalf of his people, his homeworld, against the Enemy-to-come. Then, he had felt only a sense of pride. He had been accorded every pleasure, every desire: his kin were left behind with great prestige and wealth. They would build monuments to his memory. Now he sat in the Enemy's home system, at the controls of the destroyer/probe. It was a handsome craft: two concentric spheres, each as perfect as his world, each rotating within the other. It had two functions: the first, to send information to his leaders; the second, to destroy. The warrior passed through the alien solar system without difficulty, and sped toward his target: the planet where the Enemy-to-come dwelled, unaware as yet of its future crime. The world itself -- Earth, an ugly word, bitter on the tongue -- was not as hideous as the warrior had imagined, with its swirls of blue and green. There was, in fact, an odd beauty to it. For an instant, the warrior permitted himself to consider the life-forms dwelling there, on the green landforms, in the blue oceans: They were unaware of the crimes that would be perpetrated by their heirs, and therefore not guilty. The Xindi knew nothing of their culture: perhaps they were not so different from his own people. He censored the thought at once: Such reflection was dangerous, and could only hinder his mission. He slowed his vessel, and dropped down into the lower atmosphere, confident that he would not be detected, given the primitive science of the natives. He programmed the targeted area -- a peninsula and island in the western hemisphere -- into his weapon's sites. All went as he had practiced in the hundreds of simulations, yet he could not shake a feeling of displacement, of anxiety -- was it caused by his great distance from his homeworld, or was it cowardice in the face of his own demise? The ancient ceremonial armor, thicker and heavier than the sleek battle armor to which he was more accustomed, made his fingers feel thick, even clumsy, as he pressed the controls; beneath it, his scales had grown overheated. Since there was nothing he could do to help his body cast off the unwanted heat, he shrugged off all concerns about himself -- they were, at this stage, useless -- and watched, with grim delight, as the weapon performed exactly as designed. He glanced at a small monitor showing the destroyer/probe from the exterior: The concentric spheres rotated into position so that the emitters lined up perfectly. The deck beneath his feet began to hum as the weapon powered up. He watched the bitter-named Earth on the viewscreen as a blast of pure destruction streamed from his vessel and strafed the island and peninsula, as well as the body of water where they rested. Even from the stratosphere, the warrior could see plumes of steam rising from the sea, black smoke streaming up from the land. Marvelous; just as in the simulations. The warrior finished his task with a sense of accomplishment, and sent the triumphant information back to his leaders: the weapon had worked precisely as designed. So this had been the source of his anxiety: the possibility of failure. Now that it was gone, he feared nothing. He received back a prerecorded message of congratulations and farewell. He programmed his vessel to self-destruct without hesitation or reluctance. He did not think of his children, his mates, his parents, or his fellow warriors. He did not, in fact, permit himself to think at all. He merely braced himself physically for what was to come, and when at last the destroyer/probe imploded, there was no time even to flinch. He was, like his victims on the surface, killed immediately, his scale-covered flesh seared in a blindingly bright millisecond. However, an explosive in the vessel's engine failed to ignite; the exterior of the destroyer/probe remained intact, and tumbled towards the planet surface -- evidence for alien hands to paw over, alien minds to contemplate. Even his corpse failed to be incinerated -- more evidence, to indicate the involvement of his species. Had the warrior lived to know this, he would have been deeply disappointed.